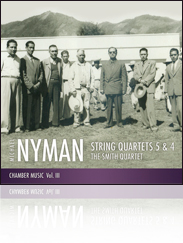 For over 20 years The Smith Quartet have been at the forefront of the world’s contemporary music scene. 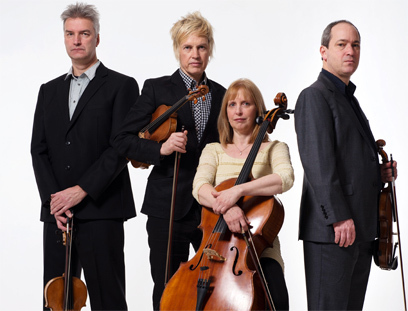 They have developed a repertoire by some of the world’s most exciting composers and have established an international reputation for their dynamic style and original approach to contemporary music. Performance, Composers Workshop and Masterclasses. The quartets residency resumes on February 4th 2019 with a day of activity including Recitals, a Composers Workshop and coaching sessions with student performers. Michael Nyman’s String Quartet No.2 has been showcased to great acclaim in Configurations, a dance work by Trinity Laban alumnus Shobana Jeyasingh, conceived as a statement of affection for this music and the potential for adventure in Bharata Natyam, a genre of Indian classical dance. This music is performed alongside two other works evocative of movement and dance-like structures: Graham Fitkin’s Servant and Witold Lutos&lstrok;awski’s Five Folk Melodies. 2.30pm Peacock Room, King Charles Court. 3.30pm Masterclasses: G35, G48, G15. Following the recital, The Smith Quartet will lead open masterclasses with Trinity Laban students. 2018 marks the 100th anniversary of Poland regaining its independence as a republic. This will be celebrated globally this November with a worldwide music project ‘100 for 100’. The Decades of Freedom celebration will present more than one hundred works by Polish composers from the last one hundred years. As part of this project The Smith Quartet will perform with award-winning vocal group Theatre of Voices at the Queens Hall in The Black Diamond at The Royal Danish Library in Copenhagen, Denmark, on November 11th 2018 at 16.00 as part of a series of connected worldwide performances. The programme includes works by Krystyna Moszumańska-Nazar, Witold Lutoslawski, Rafał Augustin, Agata Zubel, Grażyna Bacewicz and Henryk Mikołaj Górecki. A detailed programme is available here. 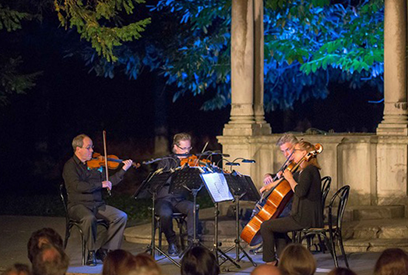 The quartet performed at the Ravenna Festival, Italy, at the historic Chiostro della Biblioteca Classense, performing the Italian premiere of Michael Nyman’s 5th quartet as well as works by Gavin Bryars and Steve Martland. 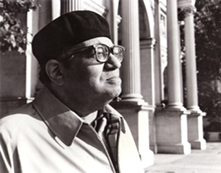 Released on Matchless Recordings, Music for Piano and Strings Vol.3 is the final volume of all the works written for Piano and Strings by Feldman, which was recorded live at the Huddersfield Contemporary Music Festival in 2006. Featured works include Spring of Chosroes (violin and piano), The Viola in My Life (viola and piano) and Trio, the mesmerising work for violin, cello and piano. Recorded and produced by Sebastian Lexer, this volume celebrates 10 years of extraordinary collaboration. We’ve included here the beautiful notes that John Tilbury has written for the booklet. Commencing their residency in January 2018 with performances of Glass and Volans, lectures and student coaching sessions – the quartet continue to have a strong input into many areas within the Conservatoire during 2019. The Smith Quartet gratefully acknowledges the support of PRS for Music Foundation, Arts Council England and the RVW Trust.